Homemade stovetop cheddar mac and cheese, with bacon, apples and walnuts. Hello new favorite comfort food. It tastes like fall, happiness and home. 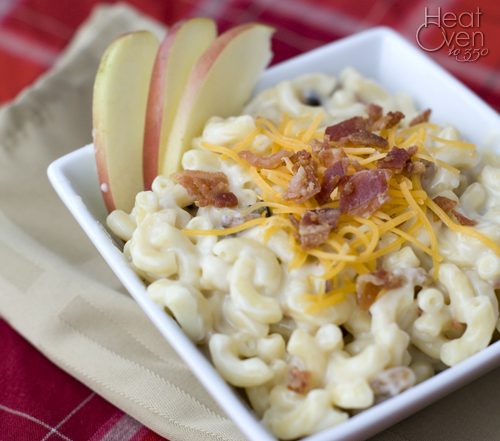 Apples and cheddar are one of my favorite fall-time food combinations, and the chopped apples are terrific in this recipe. They give a sweetness that helps balance out the other flavors. I'm not a throw-bacon-on-everything kind of gal, but the bacon really belongs in this dish. It gives it a smoky, deep flavor that is just so good. Walnuts add a little crunch and nutty flavor and round out a perfect comforting meal. Maybe it will be the first flakes of snow, or maybe just a cold, windy day, but if you're finding yourself wanting a fast, easy, comforting meal sometime soon, you can't do much better than this. In a large saucepan, bring water to a boil and cook pasta according to package directions. While water is coming to a boil, in a medium sauce pan over medium heat, melt butter. Add flour and whisk together. Cook for 1 minute. Slowly (very slowly at first so that you don't get lumps) add milk, whisking well after each addition until the milk is incorporated. Cook and stir mixture until it thickens, about 4-5 minutes. Remove milk mixture from heat and stir in cheeses until melted. 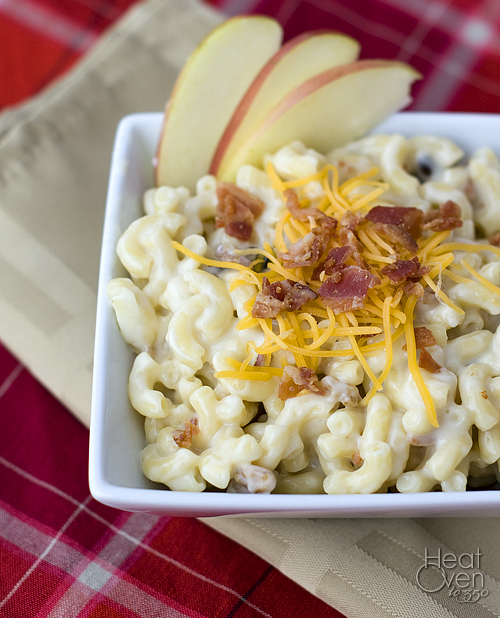 Whoa, I would have never thought to add apples to mac n' cheese but that sounds perfect. Yum! Wow, talk about fall comfort food! I love the addition of apples, I've never thought to do that.